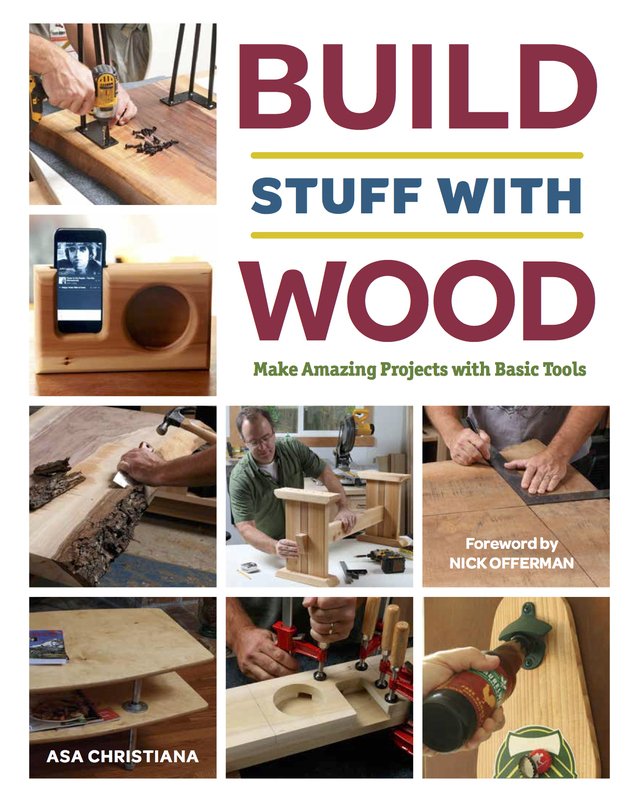 At Fine Woodworking magazine, I learned a lot about building with wood, but this blog is about building anything and everything, not just woodwork. Although I was once the editor of Fine Woodworking magazine, I was a kid before that, building bikes, model rockets, and forts. And unlike most kids today, I got exposed to building stuff early and often. We didn’t have as much to distract us, and parents weren’t really paying attention! That boredom was a good thing. We had to fill it with something, and I learned I was one of those people who loves to make things. Later I went to technical school for high school, and learned the machinist trade (building with metal). After college, I learned about woodworking, which turned out to be a close cousin to metalwork. So when I bought a house, back East in the Connecticut woods, I went nuts on it. I built a deck, board-and-batten doors throughout the house, a home office, wood floors, steps, a new shower, tile floors, a kitchen island, even toilet-paper holders–all with our own design flavor (a work in progress!). You’ll hear me say this a lot, but building stuff is beyond awesome. As my skills grew I was able to beautify my world, customize the inside and outside to our lifestyle, and make everything personal. Then there’s the bragging to friends. Now in Portland, Ore., I’m doing the same on our new fixer-upper. Journalists don’t get rich, but luckily for me, I like turning mediocre houses into cool ones. I’ve always loved building things. Maybe you do too. Or maybe you have the interest but just need a helping hand. This blog is for you. I’ll show how easy it is to build all sorts of stuff. These days, I’m a writer, editor, and photographer who focuses mostly on houses, woodworking, and the maker movement. So as I discover awesome new makers, new tools, new projects, and new ways to trick out your house or pimp your ride, I’ll share it all here. There countless cool ways to build things, like using plumbing fixtures as connectors. The home center is a playground, and the Internet makes even more materials available. Projects in this blog could be almost anything, from a bike rack to a full patio, from light inspiration to serious perspiration, but it will always be fun. I think you’ll be surprised at how do-able most projects are once you dive in. I hope you’ll dive into this blog. Comment, ask questions, suggest topics, and let me know what you think. When I worked at Fine Woodworking magazine, I shot this cover story with Nick Offerman, from NBC’s Parks & Rec. So if you build things, you might even gain a celebrity friend like I did (not to brag or name-drop…). I’d welcome an opportunity to work together with you on some content. Get in touch when you have a free moment or two. Hi, I love your Japanese tori gateway design. It is reminiscent of the gateways you would see in japan. You have a 2 part series on how you made the actual gate but do you also have instructions or videos on how you made the gateway above the gate. If so, can you send me the link to the information? Thank you so much. Hey Sean, yeah sorry about that. I didn’t have time to document the build but it’s not hard at all. I used a combination of little L-brackets to join the pieces, wherever I could hide them, and where I couldn’t I drilled deep counterbores through the parts and used long screws to hold things together. As for the arched top piece, I cut it on the bandsaw (to sure how to do it with any other tool) and just screwed it on from above. The whole thing is very solid. One last note, I built the whole assembly first in my workshop, minus the arch part, and then got help from a friend to hoist it up a ladder and sit it on the fence posts. Thanks so much. It is absolutely stunning.